Three teams of scientists have used the National Science Foundation's Very Long Baseline Array (VLBA) radio telescope to learn tantalizing new details about how Sun-like stars are formed. Young stars, still growing by drawing in nearby gas, also spew some of that material back into their surroundings, like impatient infants that eat too quickly. The VLBA observations are giving astronomers new insights on both processes -- the accretion of material by the new stars and the outflows of material from them. "For the first time, we're actually seeing what happens right down next to the star in these young systems," said Mark Claussen, of the National Radio Astronomy Observatory (NRAO) in Socorro, NM. Claussen and other researchers announced their findings at the American Astronomical Society's meeting in Chicago. Material attracted by a young star's gravitational pull forms a flat, orbiting disk, called an accretion disk, in which the material circles closer and closer to the star until finally drawn into it. At the same time, material is ejected in "jets" speeding from the poles of the accretion disk. "The VLBA is showing us the first images of the region close to the star where the material in these jets is accelerated and formed into the `beams' of the jet," Claussen said. "We don't understand the details of these processes well," Claussen said. "These VLBA research projects are beginning to help unravel the mysteries of how stars like the Sun form." The teams are observing clumps of water vapor that naturally amplify radio emissions to see details smaller than the orbit of Mercury in young stellar systems as well as track gas motions. The clumps of gas are called masers, and amplify radio emission in much the same way that a laser amplifies light emission. "These images are just fantastic," said Al Wootten of NRAO in Charlottesville, VA. The maser clumps or "spots," emitting radio waves at a specific wavelength, can be tracked as they move over time. In addition, by measuring the Doppler shift in the wavelength of these emissions, astronomers can determine the speed at which the gas is moving. 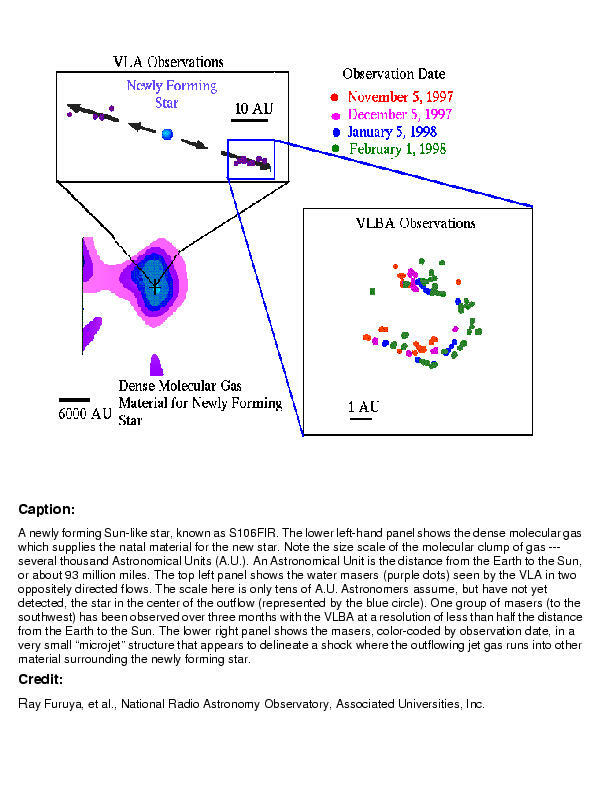 In an object known as S106FIR, 2,000 light-years away in the constellation Cygnus, a team of Japanese and U.S. VLBA observers led by Ray Furuya, a graduate student from Japan's Nobeyama Radio Observatory, has tracked the motion of material outward in the jet. This object, embedded in a dense cloud of molecular gas, the material from which the star is forming, shows maser spots moving in two directions as the jets emerge from both poles of the accretion disk. "The water masers are the only way we can detect the outflow from this young star," Furuya said. The VLBA observations can discern details as small as half the distance from the Earth to the Sun. "We can see outflow on scales the size of our Solar System. We think this object is one of the youngest protostars known," Furuya said. In another object, dubbed IRAS 16293-2422, in the constellation Ophiuchus, astronomers believe the water masers clearly show the outflowing jets of a young star and may be tracing the accretion disk as well. The young star is one of a pair of stars in a binary system some 500 light-years distant. The water-vapor masers are seen around only one of the pair, however. "In this system, we see outflow in the jet and also an elliptical ring of masers that may be part of the accretion disk," said Wootten, leader of the team observing this object. "The VLBA is showing us details as small as the size of Mercury's orbit around the Sun, a great help in understanding the physics going on there," Wootten said. A team composed largely of astronomers from the Harvard-Smithsonian Center for Astrophysics in Cambridge, MA, also used the VLBA to study water masers in a young stellar object 2,500 light-years away in Cepheus. This team sees maser spots moving in opposite directions away from the young star on scales of ten times the diameter of the solar system, presumably tracing the jet or wind. On smaller scales, there is a circular loop of masers which the astronomers believe surrounds the young stellar object. "The loop probably represents the edge of a dusty shell of gas smaller than the Earth's orbit. The star is several times the mass of the Sun and its heat evaporates material closer in," said Nimesh Patel, leader of the team. The ability to see the details of stars still undergoing their formation processes is extremely valuable to understanding the details of those processes, according to Claussen, a member of the teams led by Furuya and Wootten. "The VLBA images show detail about 100 times better than those routinely available from other radio telescopes," Claussen said. "Studying these systems by observing the clumps of water vapor that act as masers is not particularly difficult with the VLBA. There are hundreds of young stars that we can study this way, and that means that we have a tremendous opportunity to learn just how stars similar to our Sun are formed and interact with their surroundings in the early parts of their lives." VLBA offers astronomers the greatest resolving power, or ability to see fine detail, of any telescope currently operational. The NRAO is a facility of the National Science Foundation, operated under cooperative agreement by Associated Universities, Inc.